Block’hood is all about relationships. Every block that is placed down interacts with the blocks around it. Placing trees next to apartments make the residents happy, producing more resources to be used elsewhere. Place solar panels next to each other to increase their productivity. Much like how the real world works, how we interact with the buildings and resources around us, how that it improves or minimises our productivity, Block’hood recreates these emotions. Related reading: Our interview with the developer behind Block'hood. Yes, I myself am somewhat confused (or more scared) that a building simulator has me thinking about relationships. There are no human like avatars that populate the building complexes I created, they’re just an abstract number at this stage. Perhaps it could be addressed by the time we get to the full release. And, when you take a step back and look at what you’ve built, you see an empty wasteland. Yes, the lights turn on at night, and you can hear the sounds of working life, but it’s a ghost town, an eerie feeling considering it’s a bustling marketplace and living area. 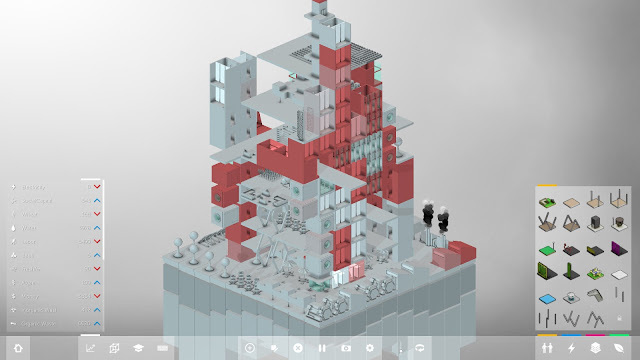 Above all what shines about Block’hood is at its core, a simple design simulator. Unlike the city builders like Sim City or Cities: Skylines, there is no need to worry about roads, public transport, or where oil wells can be found underground. All that you have to worry about is what is happening above ground. Each lot is made up of a geometric grid. 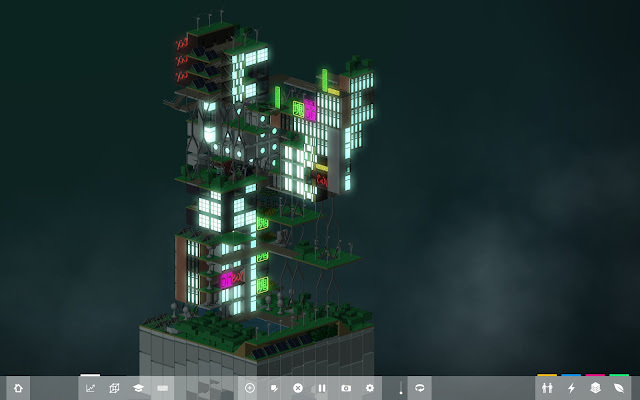 In addition to building on each grid, rooms and offices can be stacked on top of one another, creating a skyscraper. A variety of blocks create resources. Outside the tutorial, which does a great job of explaining how these resources work on their own and with each other, there is a sandbox mode and a challenge mode. The challenge mode is where I spent most of my time. Given a goal, such as to collect x units of water, or x population, it encourages creativity in building design and resource relationships. Many challenges lock off blocks to use, forcing you to be careful of not overpopulating an area. For example, a small unit requires fresh air, electricity, water and leisure in order to produce labour, greywater, waste and consumers. These products are needed for different buildings, with everything working meant to be working in harmony with each other. If you have too many houses, or not enough water, or anything that it requires, there’s a good chance your set up is inefficient or worse, incorrect. Luckily, there is a lot of information to ensure your block is producing resources as efficiently as possible. The analysis tab can tell you the details of every block, how much it’s producing or if it’s failing. You can also see what resources are getting used up to quickly and which are being mass produced, creating enough supply. The sandbox mode is less about relationships and more about building something truly breathtaking. 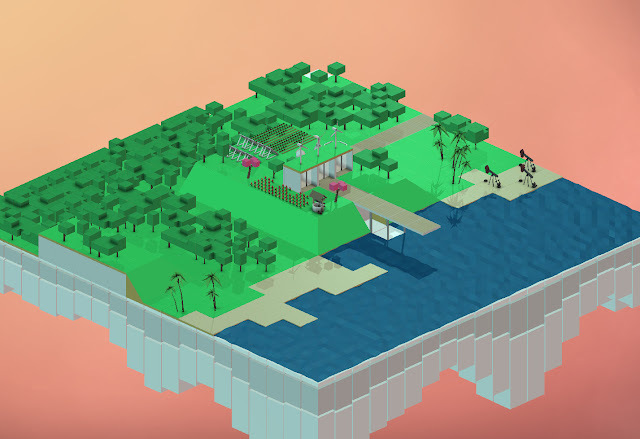 Block’hood has a simplistic art style. It’s somewhat reminiscent of LEGO building blocks, as each piece fits effortlessly onto one another. The geometric style makes skyscraper building almost effortless, as you have to just place buildings on top of one another. With the simplicity of the game design as well, it means you don’t have to worry about any water/electrical problems, as the management system distributes those automatically. It’s almost therapeutic, building a tall structure without any limitation, or pressure from other factors, even if it now means I want fully grown trees outside my apartment windows from now on. In both of these modes, the overarching feeling is that I was never pressured to do anything or build anything. Normally you have to start building certain structure firsts, and use those structures to move onto bigger and better things. You can start building with your creativity, and every block and resource is there to facilitate that. I am excited to see this game grow. The foundations are in place for a creative and enjoyable building simulator. And for something that is in early access, I was taken back by how complete the game feels. I look forward to where Block’hood goes to from here. In his interview to Digitally Downloaded, Jose Sanchez has spoken about how he would like to include plots that have different lifestyles, and plots that connect with one another. I’m looking forward to continue playing this one, and continue to learn and appreciate how these products work with one another in their own plots.